British Spotted Ponies have been known to exist since prehistoric times - they appear in cave paintings in France dating back around 20,000 years and have also featured in Egyptian pictures dating from 1400 BC. They were at one time feral in the British Isles and their spotted coat pattern was their natural camouflage as they roamed the heaths and forests of ancient Britain. Through history Spotted Ponies have been regarded as somewhat magical and mystical and were subsequently highly regarded by Royalty and noblemen. During Roman times, some of the mounts of the more important Officers were spotted horses of great elegance; and during the dark ages many spotted Ponies were sent as gifts between the Royal Families of Europe. 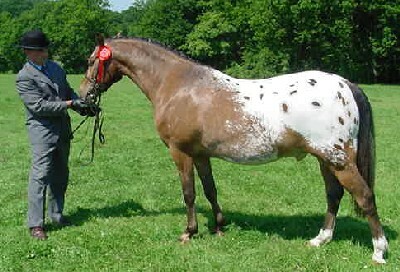 After World War II there was a great awakening of interest in spotted horses. Many of which were exported to Australia, America, Canada, and Europe. In 1947 the British Spotted Horse and Pony Society was formed to keep a register. However during the 1960s and 1970s they became relatively rare and in 1976, the Society split with the ponies of 14.2hh and under being looked after by the British Spotted Pony Society, while the bigger ones were registered with British Appaloosa Society.